Don’t gamble with your body! Protecting your feet and taking care of your body will significantly improve your quality of life, keep you active longer and decrease the chance of injury. I’m not against wearing high heels! I do, however, have specific recommendations for the type of shoes you should be looking for if you want to wear high heels based on your individual biomechanics. There are many women who will not be able to tolerate high heels due to the genetic biomechanical structure of their feet. 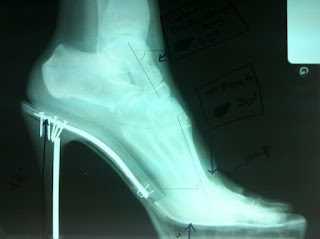 Whether or not you can tolerate high heels is directly related to the biomechanical structure of your feet. you are at risk for developing bone spurs, osteoarthritis, degenerative joint disease and lateral ankle strain (to name a few). Determining what type of shoe that works best for you is pathology specific! What works for one person, will not necessarily work for another person. Ah, yes, those were the days! I can’t bring myself to throw them away. 1. With a true heel height of 3 and 1/2 inches, they are too high and putting too much pressure across my foot and ankle joints – not to mention my knee, hip and lower back, which can cause joint damage, muscle strain, tendonitis, bunions, hammertoes and a multitude of other problems. 2. There is no midfoot or rearfoot strapping, which is forcing me to put more strain and wear-and-tear on my tendons, joints, and muscles – not to mention my knees, hips and lower back. With no rearfoot strapping, I am struggling to keep my foot in this shoe! 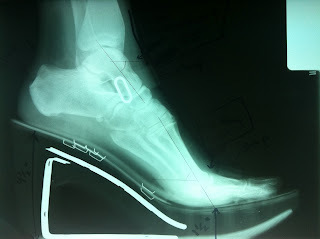 I am crunching down my toes so that I can stay in the shoe, which causes more inflammation, swelling, strain and damage. This can cause ‘Tired Leg Syndrome’ as well as a multitude of other problems. 3. The combination of the aggressive angle of the high heel and lack of midfoot and rearfoot strapping is forcing my joints, tendons and muscle to struggle to stay in my shoe. 1. 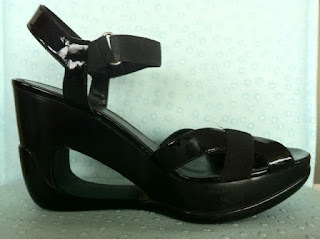 Because of the wedge style, this shoe has a true heel height of 3 inches. I’m getting the height (for fashion) but not as aggressive ’tilt’ on my foot and ankle joints as the previous shoe. 2. 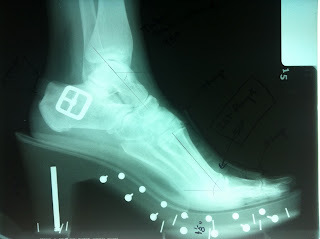 There is midfoot and rearfoot control, which helps decrease mechanical strain, the chance of injury and pain. 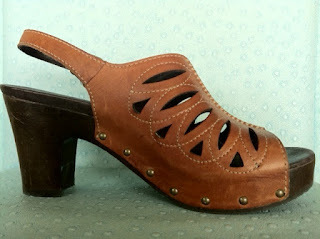 This is the Dansko Rowena and it is currently my ‘go-to’ casual heels to wear with jeans. 1. The wedge in the front of the shoe is thick and rigid for more biomechanical control and increased protection for the foot structures such as joints, tendons and muscles. The true heel height is 2 and 1/8 inches. 2. There is midfoot and rearfoot control for more biomechanical control, which means less strain and more comfort.